On Sunday, 2 May 1982, the MAE WEST bio-pic received a generously detailed TV review by John J. O'Connor in The New York Times. This is Part 5, the conclusion. • • A happy ending of sorts has been devised for the finale, but by that point, viewers may have gained the uneasy impression that, despite all the time covered, something of the essence of Mae West has escaped the production net. • • While the film has been fleshed out with several elaborate production numbers, her character has been reduced to oversimplified speculations, draped carefully in veiled allusions. Far less is learned about the life of Mae West than about the talent of Miss Jillian, who manages to bring extraordinary freshness to the portrayal of a woman whose voice, gestures and imposing presence evolved into something approaching rigid caricature, the essential stuff of impressionists. Miss Jillian never loses sight of the woman beneath the formidable image. 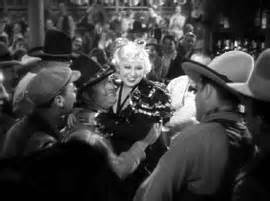 Even with a rather unsubstantial script, she creates a Mae West still very much worth watching. The Hill-Mandelker production was directed by Lee Philips and produced by Terry Morse Jr.
• • This was Part 5, the article's conclusion. If you missed Parts 1-4, go back to last week. • • Source: Article-Review for The New York Times; published on Sunday, 2 May 1982. • • Note: If Jim Timony really looked like handsome James Brolin, would Mae have married her manager? I'm betting on it. How about you? • • Usually supportive of his friend Mae, Sidney Skolsky vented his frustrations in The Los Angeles Times on Sunday, 9 May 1937. Skolsky wrote about the perfidiousness of Mae's denials when "she insisted that she was leveling with the press when she told them she had never been married to Frank Wallace." He said he did not trust Mae any longer. • • Ah, those pesky retractions about husbands and trips to the altar. Why did she do it? • • On Monday, 9 May 2005, Broadway buffs learned that Diamond Lil's theatre was to be renamed. Mae West's play "Diamond Lil" was a huge hit for the Royale in 1928. However, on May 9th in New York City, the Plymouth and the Royale were re-dedicated as the Schoenfeld and Jacobs Theatres. • • Mae West said: "This is Timothy Dalton, my new discovery. He is an actor as good as Sir Larry Olivier, and maybe even better. When he plays with me in 'Sextette,' he will become one of the most known actors in the world." • • A movie magazine interviewed Mae West. • • Elza Schallert wrote: "Go West, young man, go West," counseled good old Horace Greeley. And if he were alive to-day, he'd have a hard time trying to get them to do anything else. For they're all going for lusty, gusty Mae West — — who's now ''going to town" and doing plenty of damage to Garbo and Dietrich on the way. • • Elza Schallert wrote: And how does Mae West, herself, explain the hit she has made? Read this interview and be surprised! . . .
• • The Mae West Blog was started ten years ago in July 2004. You are reading the 3437th blog post. Unlike many blogs, which draw upon reprinted content from a newspaper or a magazine and/ or summaries, links, or photos, the mainstay of this blog is its fresh material focused on the life and career of Mae West, herself an American original.